Jiangnan Shipyard was established in 1865 (Tongzhi 4th year of Qing Dynasty). The previous name was Jiangnan Machine Manufacturer and was renamed as Jiangnan Shipbuilding Works in 1912. Also known as the Kiangnan Dock and Engineering Works, in the 1920s Kiangnan built six new river gunboats built to replace old gunboats on the Yangtze for the US Navy's South China Patrol. In the closing days of World War II the docks at Kiangnan Dock and Engineering Works were used to repair US Navy ships. The facility was renamed the Jiangnan Shipyard in 1949. In 1996 the yard was transformed into state-owned solely funded Jiangnan Shipyard (Group) Company Limited. As the first generation of industry workers in China was nurtured in Jiangnan Shipyard, the yard is regarded as cradle of China's national industry. China has become the third ship-building country only second to Japan and South Korea, with gaining foreign exchange of 0.119 billion US dollars in 1996, up 95 per cent over 1995. Of the total value (17.9 billion US dollars) created by China Shipping Industry General Corp. in 1995, that from Shanghai Shipping Industry Corp. (SSI) accounted for 50 per cent. Shanghai Kiangnan Shipyards and Hudong Shipyards manufactured crab ships, refrigerator ships, tankers, liquid gas ships, chemical product ships and high-speed naval ships of world-class standards, which were mostly exported to Europe, the United States and countries in the Southeast Asia. The prices of these special ships with high-tech added values are as two or three times as those of normal ones, though their capacities are the same. Jiangnan Shipyard Zhangjiagang Branch lies in the west of Zhangjiagang with distance of only 1km to Zhangjiagang International Container Port, neighboring Shanghai to the east and Suzhou, Wuxi and Changzhou to the southwest. With more than 130 years experience in developing and building various kind of merchant ships, Jiangnan Shipyard has successfully delivered to worldwide shipping market a large variety of highly sophisticated vessels such as liquefied gas carriers, car carriers, crude oil tankers, Panamax bulk carriers, Handymax bulk carriers, Lake suitable bulk carriers, multi-purpose cargo ships, fast feeder container ships etc. And in particular, gas carriers have become one of the major products of the shipyard in the past years. Apart from new building section, Jiangnan Shipyard has specific divisions specializing in manufacturing pressurized tanks liquefied gas carriers, large steel structures for civil architect engineering, variety of mechanical and electrical equipment, nonstandard equipment, pressure containers, port machinery etc. To be in line with international standard and quality system, the shipyard has been approved of and certified for qualification of ISO 9001 by well-reputed authorities of China. 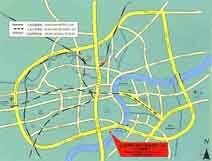 As of June 1998 Shanghai planned to construct a new shipyard in Waigaoqiao Pudong New Area to build 200,000-tonnage ships. The Jiangnan Shipyard Group Company had completed a study which had passed the examination organized by the International Engineering Consultation Company under the State Planning Commission. Under the plan, two drydocks, with one being 480 meters long and 106 meters wide and the other 350 meters long and 76 meters wide, will be built to manufacture 1.8 million tonnages of ships a year. The new shipyard, which was expected to be the largest in China, will cost 7 billion yuan. Of the investment, 4.4 billion yuan will be spent on the two drydocks and the rest will be invested in a diesel factory. At Jiangnan Shipyard, one of CSSC's oldest and busiest yards, a proposed VLCC dock, a joint venture between CSSC and the city of Shanghai, will increase overall newbuilding capacity to 1.5 million dwt a year. There are a number of important contracts being carried out, including a series of five 1,025 teu fast container ships on order to LR class for Norasia Services, Switzerland. The first ship in the series was completed in March 1999. The Jiangnan shipyard is manufacturing six Panamax ships, ten 74 000 ton vessels for delivery in 2002 (for clients in Hong Kong, Greece and Germany), and is constructing eight freighters with a gross displacement of 610 000 tons in co-operation with the Hudong Shipbuilding Group. With an annual capacity of 15000 tons of hull subsection and 5000 tons of large-scale steel parts, it has made hull subsection and sorts of steel parts for clients at home and abroad such as Mitsubishi Heavy Industries Ltd. Nagasaki shipyard (Japan), Hyundai Group(South Korea). BH(Japan), China Jiangsu Shipyard, Shanghai shipyard, Zhonghua Shipyard, Qiuxin Shipyard and Wuhu Shipyard. It has contracted to work on large-scale projects such as Nanjing Lukou International Airport, Shanghai interior elevated high - way, the 3rd phase of Baoshan Iron and Steel Plant, Guangdong Maoming 300 thousand tons of Ethylene Project. Shanghai Great Theater, Beilun Port Power Plant, etc. The branch has been acknowledged by the international major classification societies such as ABS(U.S.A.), LR(UK), GL(Germany), DNV(Norway), NK(Japan) and ZC(China). The August 2000 merger of Jiangnan Shipyard (Group) Co Ltd and Qiuxin Shipyard was a major step of China State Shipbuilding Corporation (CSSC). Qiuxin Shipyard became a subsidiary of Jiangnan Shipyard, but the name of Qiuxin will remain in public for some time in order to maintain its relationship with other partners. Shanghai's shipbuilding industry was seriously damaged by the financial crisis that swept over Asia in the 1990s. The competition among domestic and international shipyards disrupted the domestic Chinese market and hindered its recovery.